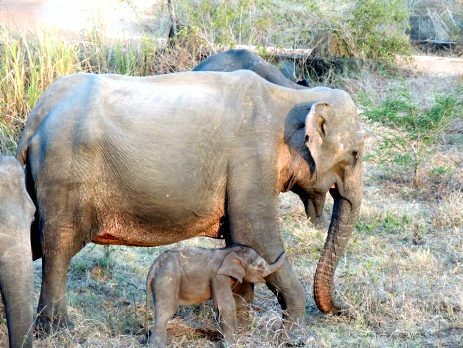 Volunteers on the elephant project in Sri Lanka were recently privileged enough to see a newborn baby elephant in the national park. The team had been keeping an eye on a heavily pregnant female elephant over several months, when one day they could see her behaviour had changed – she was protecting something very small – her new baby. The baby elephant has been given the name “Lorna” by the elephant project volunteers. She is the daughter of Kumundi, a very calm mature female. Kumundi spends time with Kwanthi, another mature female who had a baby herself less than one year ago. Despite the support network around her, Lorna’s early days may be a struggle. 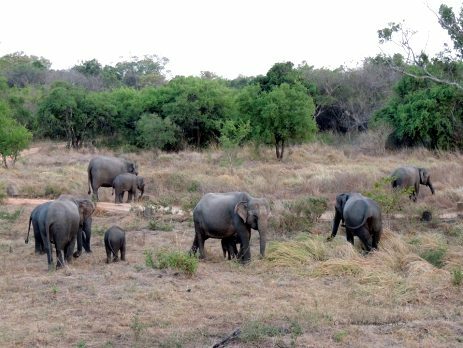 The area where the elephant project is located is currently in the midst of the dry season, and this is due to continue for several months more. During this period, food and water become continually harder to access, which makes young life harder to sustain. Lorna’s survival therefore fully depends on the ingenuity of her mother, and her ability to find nutrition for them both in this period. If Kumundi cannot get enough nutrition, and her milk supply dries up early, Lorna will have to start eating at an early age. The challenge for Lorna will then be to learn how to digest the dry vegetation that she can access during the dry season. Volunteers will be spending time monitoring Lorna’s development. Lorna is the second elephant to be born in the last few months at the national park. This is a very positive indicator of the health of the wild elephant population in and around the national park. The elephant project, located on the outskirts of the national park, has been working hard to protect these wild elephants for about 20 years. The project is essential, as before it existed, the elephant population was plummeting. The national park has open boundaries, and as such, the animals that call it home are able to wander in and out of the park in the search for extra food and water. Traditionally, elephants are nomadic creatures, which move from place to place sourcing food and water to keep them alive and healthy. This means that they spend a lot of time outside of the park’s borders and the elephant project works to protect these roaming elephants. Outside of the park, elephants are confronted with the presence of humans, which present a huge threat to their survival. The presence of the elephants also threatens the human survival too however. Villages surround the edge of the national park, and the greatest income for these villagers is farming. The villages are almost entirely encircled by their crops, and often the passing elephants will stop for a snack in the rice paddies. Not only do the elephants eat the crops, the farmers’ livelihoods, but they destroy the fields as they walk through. Elephants are immensely heavy, and their mere presence in a field can destroy several months of hard work in just a few minutes. The elephant project exists to help local people to live alongside these elephants. Rice fields are a huge draw to elephants, and as such, the project is encouraging farmers to expand their agricultural enterprise. Many farmers are now farming bees and orange trees, which elephants are seemingly averse to. This means that the elephants pass through the farmers’ fields without feeding, and the farmers are able to maintain an income. 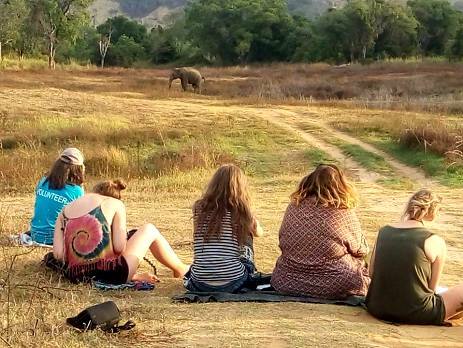 Volunteers on the elephant project in Sri Lanka spend time monitoring the elephants’ behaviour, tracking their movements on foot, analysing their movements using camera traps and doing biodiversity surveys of the local area. Understanding the local ecosystem is key, as if this area is healthy, it should be able to support the elephants that live in and around the national park. Volunteers have the amazing opportunity to witness elephants in the wild, and know that the work that they are doing is helping to keep them there. To find out more about this elephant conservation project in Sri Lanka, you can visit our elephant conservation web page or contact Anne on [email protected] and +44 (0) 1892 771 975.